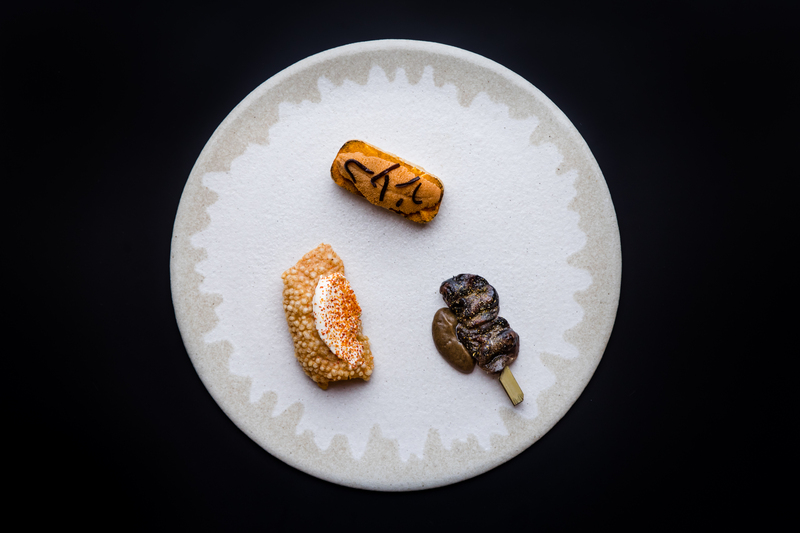 Modern Australian cuisine has become quite a buzzword in recent years here, with the likes of Michelin-starred restaurants Whitegrass and Cheek By Jowl sprouting up and offering their different renditions of it. There’s no solid definition of what exactly this cuisine encapsulates, but judging from the current offerings on the market, it can probably be best summed up as a mixture of the various cultures and foods available in Australia. The latest newcomer jumping on the bandwagon is Blackwattle, a casual spot that opened its doors in Telok Ayer last month. It’s operated by rising Australian chef Clayton Wells in partnership with Unlisted Collection. According to Wells, the restaurant’s food is inspired by his travels around the world, and features “a bit of everything” in terms of showcasing different cultures and flavours on a plate. What sets Blackwattle apart from its contemporary Australian predecessors in Singapore is its constantly-changing menu, and lack of fixed signature items. 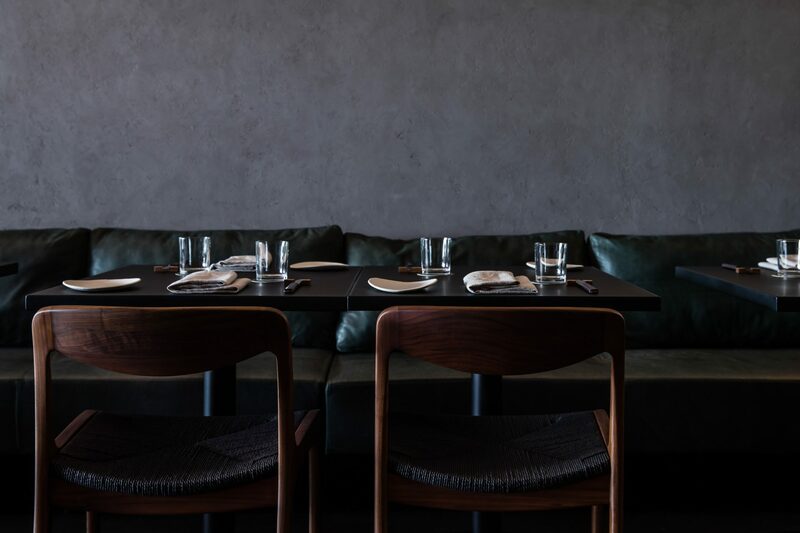 Designed by local firm Akira Kita Architecture, Blackwattle’s interiors are dressed in a chic palette of black and grey hues, with dark green banquette seats and custom-made furniture. A striking chandelier, made from an recycled aircraft engine, hangs from the ceiling for a gritty industrial touch. The restaurant also features an upstairs bar area, where customers can choose to sit at the bar counter or a side table as they knock back their favourite beers, cocktails and wines. The whole establishment seats 60 in total. 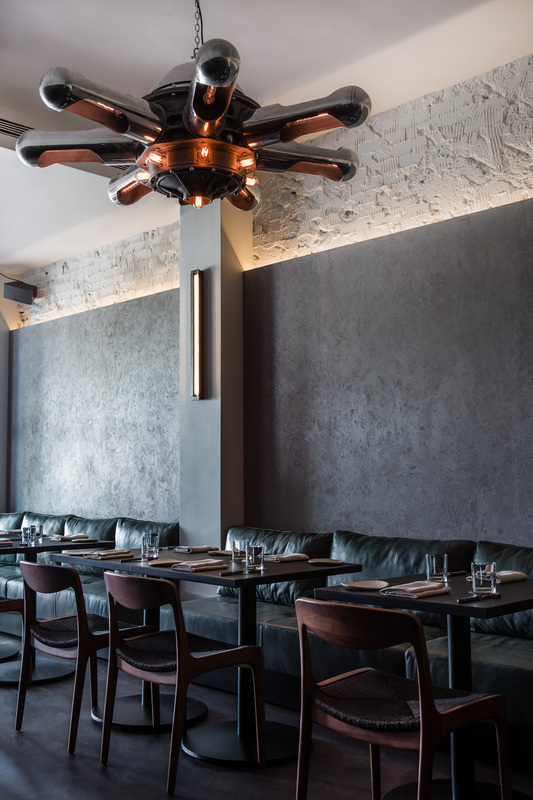 Open for lunch and dinner, Blackwattle serves three- and five-course prix fixe menus, as well as a range of à la carte dishes such as grilled duck hearts with burnt onion mustard, and fried Jerusalem artichokes with sunflower seed miso. 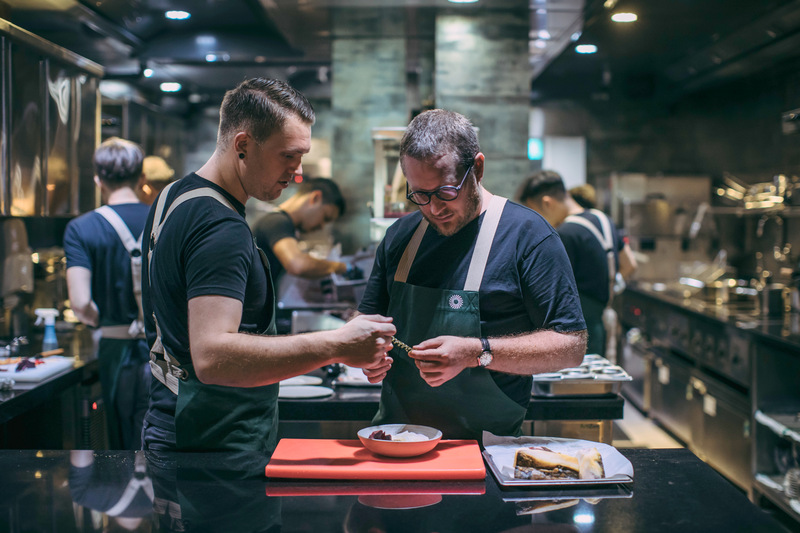 Its kitchen is helmed by head chef Joeri Timmermans, who was previously the sous chef at Automata, Wells’ other restaurant in Sydney. Wells will visit Blackwattle every month to shake up the menu and to check on operations. Wells and Timmermans at work. We opted for the five-course lunch menu (S$115++) when we recently stopped by Blackwattle, and began our meal with a snack of crisp, golden crackers of fried cheese and tapioca, which came topped with dollops of espelette pepper-infused cream. Salty and moreish, the crackers were so addictive that we couldn’t help but wish they were available in takeaway bottles. Equally delicious was our next snack of stormshell clams, which sat in a mix of rosemary-scented dashi and aerated cream that beautifully complemented the clams’ natural sweetness. Adding to that promising start was our entrée of grilled Fremantle octopus. It may sound like a pretty run-of-the-mill dish, but Wells has jazzed up this seafood staple with the addition of squid ink, red vinegar and XO sauce. The red vinegar contributed a slight tinge of sourness, while the XO gave it a spicy kick. Our only gripe about this dish was that our portion of octopus had been seared a little too much, to the point of being burnt — which resulted in an unpleasant bitterness that distracted us from the other flavours. Clockwise from left: Fried cheese and tapioca cracker, smoked salt uni toast, grilled duck hearts. This transgression was quickly forgiven, though, thanks to the homemade bread that arrived shortly after. Baked with a combination of wholemeal and malt flour, Blackwattle’s buns yielded a pleasingly firm and chewy bite. But it was the accompanying butter that stole the show, with its infusion of chicken jus and anchovy for an umami-laden treat. Let’s just say we consumed our week’s quota of butter in that one sitting. After gleefully scarfing down the bread and butter, we were served a second entrée of steamed red fish with roasted lettuce. The soft and succulent fish meat came soaked in an aromatic green sauce comprising herbs such as mint, parsley and basil, and speckled with capers for a dash of saltiness. For an indulgent twist, it was also topped with a sheet of silky smooth lardo. 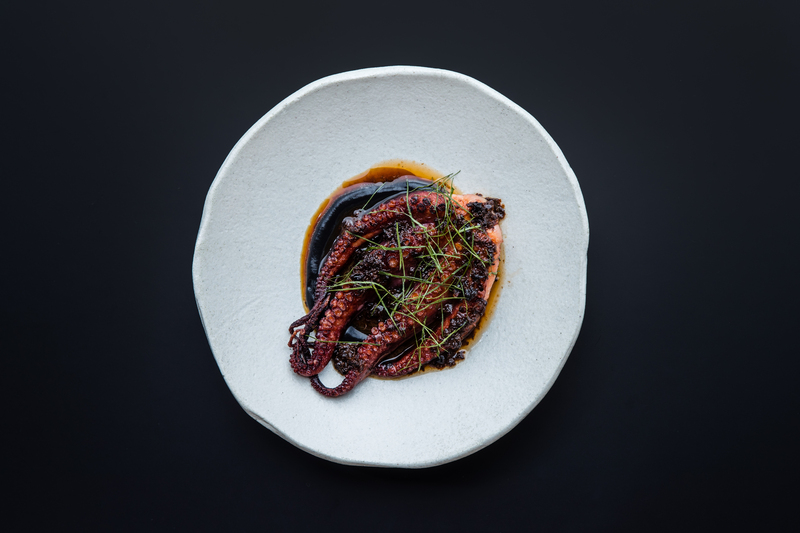 Blackwattle’s grilled octopus with squid ink, red vinegar and XO sauce. It was on to our main course of black angus beef tri-tip, a well-marbled and tender steak covered in Tamari, a type of Japanese soy sauce that’s less salty than the conventional soy sauce. Presented slightly charred, the beef was paired with wood ear mushrooms and burnt carrot purée, which lent textural contrast to the meat. While tasty, this dish seemed rather safe and unexciting compared to our earlier courses. Our dessert didn’t disappoint, though. We were served a creamy pumpkin seed sorbet, which would have been a tad cloying if not for its garnishing of freeze dried mandarin orange. It was nestled atop a bed of tangy plum sauce and burnt meringue — a combination that sounds odd on paper, but worked surprisingly well together. The pumpkin seed sorbet is one inventive dessert. 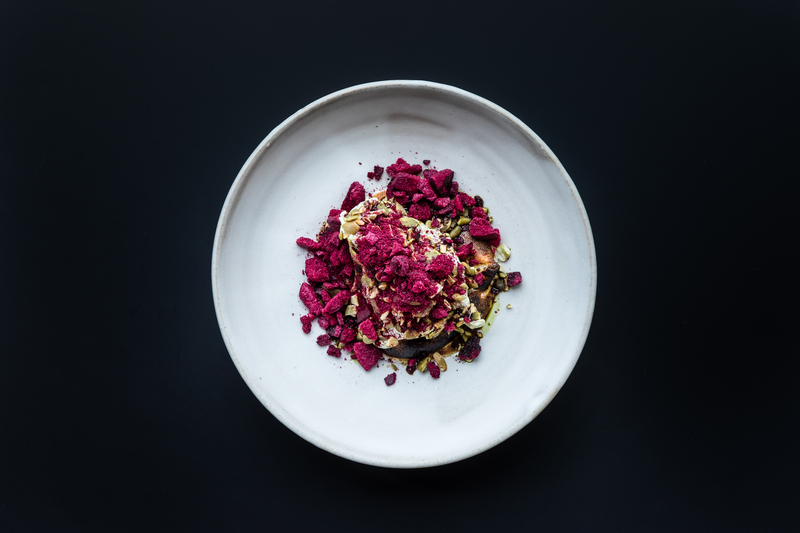 There’s still room for fine tuning at Blackwattle, but we’re rather impressed with its innovative and fearless approach in putting together unexpected flavour combinations. Some of its creations are pretty clever too, such as the clams in rosemary dashi, and the octopus matched with red vinegar and XO sauce. The restaurant has a great convivial vibe too. When we spoke to Wells last month, he expressed his desire to “take away that stiffness that traditional fine dining has“, and to create a space where diners can savour good food in a setting that isn’t intimidating. He has certainly achieved that with Blackwattle, which, when we visited, was bustling with activity and actually got quite noisy during lunchtime when it filled up. It’s the type of place we would hit up for our next boisterous gathering with friends. We’re keeping tabs on this restaurant, for sure. Recommended Dishes: Fried cheese and tapioca crackers, Stormshell clams with rosemary dashi, grilled Fremantle octopus. Price: Approximately S$115++ per person, without drinks. Noise Level: Very noisy during peak hours.